Mark Williams is lost. An astronomer at New York City’s Planetarium, he seems to have a closer connection to the starry sky than his wife, Anne, or his job. Though he doesn’t believe in the idea of fate, the universe seems to have other plans when he meets Angela, a young single mother. The stars appear to have aligned, but when a catastrophic event tears through both of their lives, Mark has to re-assess his life, faith, and place in the world. Matthew Broderick stars as Mark, reprising the role he originated Off-Broadway in 2009. Needing no introduction, Broderick is well-known for his work both in Hollywood and on Broadway. On screen he is known for roles in Ferris Bueller’s Day Off, War Games, and as the voice of adult Simba in The Lion King. On stage, Broderick has won two Tony Awards for his roles in How to Succeed in Business Without Really Trying and Brighton Beach Memoirs. He has also played the role of Leo Bloom in The Producers on Broadway (and subsequently the film adaptation), which lead to much acclaim. Elizabeth McGovern also stars. McGovern is best known for her role as the Countess of Grantham in Downtown Abbey, which has awarded her both Emmy and Golden Globe nominations. Additionally, she received an Academy Award nomination for her role as Evelyn in the 1981 film Ragtime. McGovern is also known for her roles in Ordinary People and The Handmaid’s Tale. 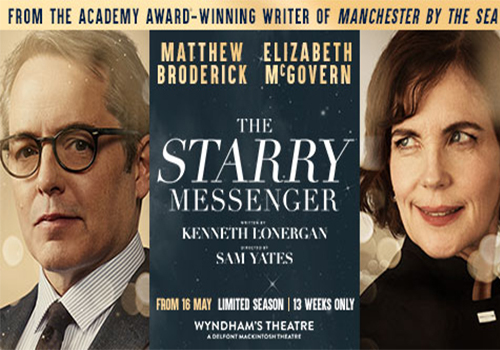 The Starry Messenger is written by Kenneth Lonergan, who won the Academy Award for Best Original Screenplay for Manchester by the Sea. Lonergan’s work stretches across directing and writing, including films such as Gangs of New York, You Can Count on Me, and Margaret. Direction comes from Sam Yates (Glengary Glen Ross). Further casting is to be announced. Tickets are sure to be snapped up fast so don’t miss out!